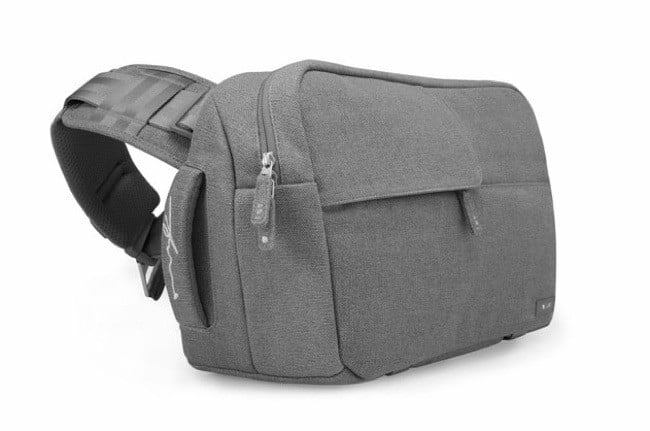 Sleek and stylish accessory manufacturer Incase has just revealed its collaboration with renowned photographer Ari Marcopoulos: a sturdy and streamlined camera bag for the DSLR-toting amateur or professional. The gray canvas bag has a water-repellent coating and was designed according to Marcopoulos’ detailed specifications, allowing for maximum functionality and protection. You will also look way cooler carrying this than that other dude with the ugly, black box-store camera bag. The bag has a hefty price tag ($199.95), but includes swanky features like faux-fur lined pockets for your iPad and point-and-shoot camera, exterior cargo straps, and cross-body ergonomic design, as well as the requisite adjustable compartments for your camera body and lenses. As an added design feature, the bag comes with a removable rain fly that features a custom grayscale Ari Marcopoulos print. Super-fans of Marcopoulos’ work will also appreciate the limited-edition book of unpublished prints, Now Is Forever, that comes with the bag. Head over to Incase to see more photos and pre-order the bag.